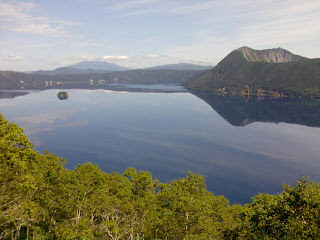 A view of Mashu-ko which some say is the most beautiful lake in Japan. In the right background is the peak of Shari-dake. To the right is the peak of Kamuinupuri ("Divine Peak" in Ainu) the high point on a subsidiary volcanic cone of the Mashu caldera.